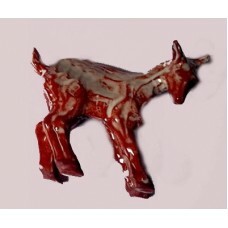 Pottery kid goat (approx 10cm high x 7cm wide, with neck forward). Handmade by a local potter for the GGGS. A limited edition. NOW available, numbers limited. Make up the complete set for the mantlepiece. Choose which Goat you want.